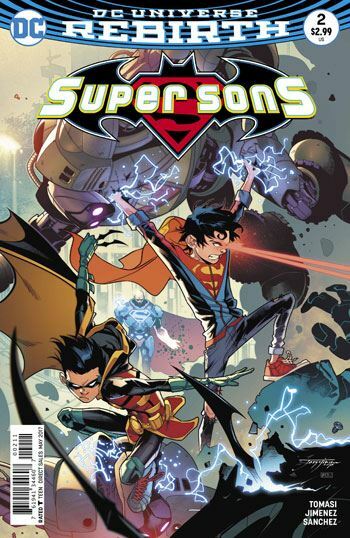 Tomasi and Jimenez deliver a really solid and enjoyable second issue of Super Sons. So often a great first issue will be followed up by a weaker second one, but that is certainly not the case here. Robin shows the ruthless manipulation that makes Damian Wayne such an entertaining character, as he tosses Superboy to Lex Luthor as a diversion. The comedic potential of the situation is played to the hilt. Actually, the comedic potential of the book is one of the best things about it. 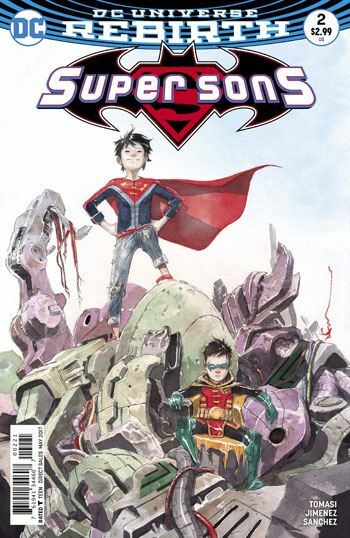 There is solid action and a strong plot, but what has been making this book stand out is the way Robin and Superboy seem to heighten the strongest elements of their fathers. Jon is trusting and well-meaning, Damian is clever and deceptive, and though the two already have a bond between them, their interaction is far more extreme than their parents. Superboy does manage to pull some status on Robin before the end of the story. It’s all in the details. And Robin concedes that he needs to be in charge of things, even though this consists of treating Superboy like dirt. The mysterious opening of the previous issue does get explained in this one, and we find out who the big villain will be for this storyline. Kid Amazo has only a thematic connection to his “father,” but has strong potential as a villain for the young duo. A totally enjoyable second issue, which bodes very well for the third one.